Special 1-3 is the third level of Special 1 in Super Mario 3D Land. It is based off World 2-3. The player starts put on a ? Block platform, which only contains a Cannon which is needed to proceed to the next platform. The next platform is in the shape of a Goomba. On this platform there are two Baddie Boxes which constantly spawn Goombas. There is also a Roulette Block near the landing point; if a Super Star is gained, the player can then destroy the Baddie Boxes for a few coins. On the other end of the platform is a Cannon to proceed to the next platform. After firing from the Cannon, the player will go through a Red Coin Ring which will spawn 5 Red Coins to collect when the player lands on the platform shaped like a Cloud Block. If the player collects all the red coins in time, they receive a 1-Up Mushroom. The player should then use the Cannon, located near the center of the platform, to proceed to the next platform. The next platform is shaped like a Bullet Bill, and has many Bullet Bills and Tail Bullet Bills (which can give Statue Leaves) firing on it, as well as a Wide Coin Block and Flying Coin Blocks which give out multiple coins, and a few small alcoves with coins in them. If the player breaks the Brick Block near where the Bullet Bills are being fired from, they can destroy the Brick Block and go into a small corridor which branches off to the left and right, nothing is to the left, but if the player goes to the right they will go into a Mystery Box where they can hit multiple Coin Blocks for coins and a 1-Up Mushroom. Near the Cannon is a green + Clock. The player should then use the Cannon to proceed to the next platform. The next platform is shaped like a Cheep-Cheep and features a Coin Block and a ? Box that can be worn for infinite coins, but Cheep-Cheeps will regularly jump out of the water to hit the player. There are also two P Switches on the platform: the one on the right spawns Rainbow Notes and if all are collected the player will receive a 1-Up Mushroom. 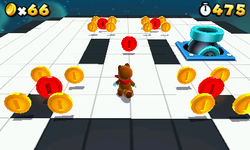 The one on the left spawns a Control Coin which leads the player to the Cannon. Another green + Clock can also be found here, near the ? Box. When the player fires from the Cannon they have a chance to receive another 1-Up Mushroom that is in a triangle formation with 2 wooden 1-Ups; the one in the center is the real one. The final area contains a P-Switch which spawns a Control Coin which leads the player to the Goal Pole. The fortress behind the Goal Pole hides a 1-Up Mushroom inside. Star Medal 1: Located on a hidden Fireball platform. To reach the platform, the player can either use the Cannon on the starting ? Block platform, or jump off the left foot of the Goomba platform. Star Medal 2: Located on another hidden Fireball platform. To reach the platform, the player can either use the Cannon on the Cloud platform, or jump off the front of the Bullet Bill platform. Star Medal 3: Located on another hidden Fireball platform. To reach the platform, the player must use the Cannon on the Cheep-Cheep platform. This page was last edited on April 5, 2019, at 18:18.